Are you planning a holiday trip to Universal Orlando this year and want to celebrate Hanukkah during your trip? Then you’ve picked the perfect vacation spot! 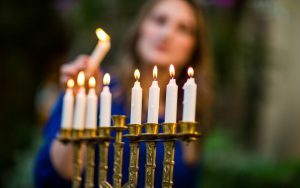 Each of the 5 Universal Orlando on-site resort has a menorah lighting ceremony for every night of Hanukkah. This year the holiday takes place from sundown December 24, 2016-sundown January 1, 2017. The Universal Orlando on-site resorts include: Loews Portofino Bay Hotel, Hard Rock Hotel, Loews Royal Pacific Resort, the brand new Loews Sapphire Falls Resort and the Cabana Bay Beach Resort. Just be sure to ask the front desk for the exact time of the menorah lighting each night of Hanukkah. The menorah lighting is in addition to all of the other holiday festivities taking place throughout the Universal Orlando Resort on-site hotels and theme parks this holiday season. It’s not too late to book your getaway at a great rate!